Another thing Anderson does in his movies that isn't quite as often noted upon, but is pretty much always there, is child endangerment. It's a running theme throughout his movies, and just like the increasingly violent doggie deaths, a source of uncomfortable humor. The human lead of this movie is a small boy, Atari (voiced by Koyu Rankin), who crash-lands a small plane onto the titular isle of dogs, and spends the rest of the movie with a mechanical bit of said plane sticking out the side of his head. He's already survived a train crash that killed his parents and destroyed one of his kidneys before the movie started, and he'll be thought dead multiple times before the end of the movie. Atari, being an orphan (hey, orphans, another running gag in the Anderson oeuvre! ), has become the ward of his distant uncle and Mayor of the fictional future Japanese city of Megasaki, Kobayashi (voiced by Kunichi Nomura, who also co-wrote the movie). Kobayashi is the descendant of a long line of cat-loving dog-haters who once almost wiped out the entire population of dogs in Japan, and he's now the leader of a secret cabal of cat-owning conspirators who have managed to get all dogs in the city moved to Trash Island due to fears of something called "dog flu" (note: the cats are not the bad guys; they are basically un-anthropomorphic and therefore innocent). The first dog sent to the island was Spots (voiced by Liev Schreiber), Atari's bodyguard dog, and Atari has come to the island to rescue him. A pack of dogs featuring four former pets (voiced by Edward Norton, Bob Balaban, Bill Murray and Jeff Goldblum) and one former stray, Chief (voiced by Bryan Cranston), watches Atari's crash, and decide to help the boy, though Chief is the lone dissenting voice when it comes to a vote. The pack, with Atari, go on a sort of quest for the lost Spots, and eventually Chief and Atari are separated from the other four, who may or may not be violently killed offscreen (hey, it's a Wes Anderson movie). Chief, though he still doesn't trust this boy, remains loyal to his pack's decision, and continues alone with Atari. So, it's basically a-boy-and-his-dog story, except (at least for American audiences, anyway), it's the dog that talks in English and the boy that is untranslated. The Japanese characters speak Japanese, without subtitles, though they are occasionally translated via other methods. Those methods being unavailable to Atari and the dogs of Trash Island, Atari's dialogue isn't. The movie is stop-motion animation, yet another frequent Anderson trademark. However, it feels very different from his earlier stop-motion movie, Fantastic Mr. Fox. I mean other than it's still very much a Wes Anderson movie, and we've gone over that. Fantastic Mr. Fox is, ultimately, a much more traditional animated movie, story-wise. It is, after all, based on a children's novel; it's still Anderson's only adaptation. 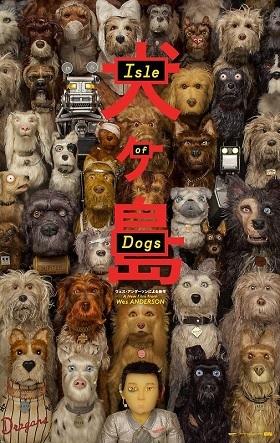 Isle of Dogs is much darker, much more violent and just all-around a much spikier proposition than Fantastic Mr. Fox. Seeing as how Fantastic Mr. Fox had trouble getting furries to actually like it back in 2009 despite being a movie about a cartoon freaking fox, it would seem that Isle of Dogs would have an uphill battle. But, luckily, Fantastic Mr. Fox has gone on to be an important cult favorite, both with furries and the animation community at large since 2009. Hopefully, furries are a bit more ready for Wes Anderson's trademarks this time around. Saw this in theaters about two weeks ago. Was thinking about doing a review but I haven't seen enough of Wes' catalogue to do it justice. When I went to see it, I found out from the ticket booth person that it had sold out every showing prior, including the one we went for, so that's amazing. I'm really hoping it'll do well. Not only that but it's really one of the only anthro friendly films this year. Great review, I think furs are gonna love this film. P.S. I also love the reappropriation of howling in the movie, as less of a comical thing. Very cute and clever. We kind of discussed this on Twitter, but it opened limited and just went wide last Friday (actually, Thursday, but that's a whole thing); I wouldn't be surprised if it ends up with almost identical box office as Fantastic Mr. Fox, but Isle of Dogs will go down as basically a hit while Fox is considered a box office bomb, because Fox opened wide when, in hindsight, it maybe shouldn't have. I'd say it's the frontrunner for Best Animated Feature, competition sight unseen; just setting aside quality, Wes Anderson didn't personally get an Oscar from Grand Budapest Hotel, and Pixar has a sequel (no Pixar sequel has been nominated for anything since Toy Story 3, not even ones people actually liked, like Finding Dory), as does Disney (to a movie that got egregiously pushed aside by the Academy), Aardman quietly flopped earlier in the year, and, uh, otherwise the field looks pretty weak, not too mention Anderson has outside chances at Picture, Screenplay and maybe even Director. On the downside, there's that whole "cultural mis-appropriation" conversation (which, to be fair, is fair) taking a lot of wind out of its sails. Caught up with this movie tonight. Too early for me to rank it amongst Anderson's films, but it certainly did not disappoint. The movie was such a joy to my eyes from the stop-motion animation and attention to scene detail, placing it a few notches above the already excellent work in Fantastic Mr. Fox.